The camp on the Greek island of Lesvos had been built with room for perhaps 600 people, but more than 3,000 were crammed into the facility on a recent day. Refugees had arrived from Syria, Afghanistan and other nations so rife with violence and poverty that Greece seemed a place of tranquility. They had trekked 40 miles from the northern port where ships land to the city of Mytilene, after enduring dangerous sea crossings that often end in death or coast guard rescue. Some were now sleeping in an old army camp that had been turned into a makeshift shelter. Some lay on sidewalks outside. The camp lacked sufficient food and clean water due to the sheer numbers of people arriving. Aid workers with the United Nations worked the cobblestone streets, picking up litter in an effort to keep the situation tolerable. They worried that if anyone fell ill, disease would spread like wildfire. “Unless there is a change very rapidly in capital control, we are afraid we will see an increase in the deterioration of the situation,” said Eugenio Ambrosi of the International Organization for Migration. 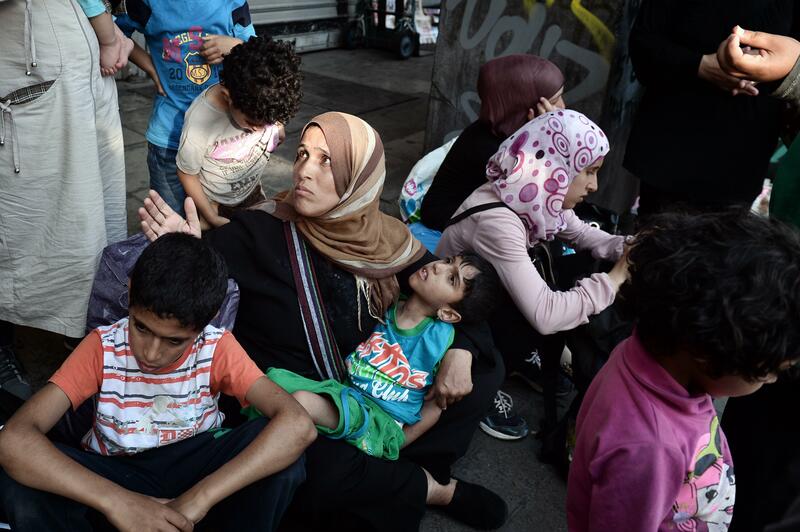 This dire situation will likely worsen as the Greek government contends with own crisis -- an economic unraveling -- and as regional conflagrations sends a widening volume of migrants and asylum seekers to Greek shores. Estimates for daily arrivals range from 900 to 2000 per day across the islands, according to municipal mayors, The International Rescue Committee and the Red Cross. 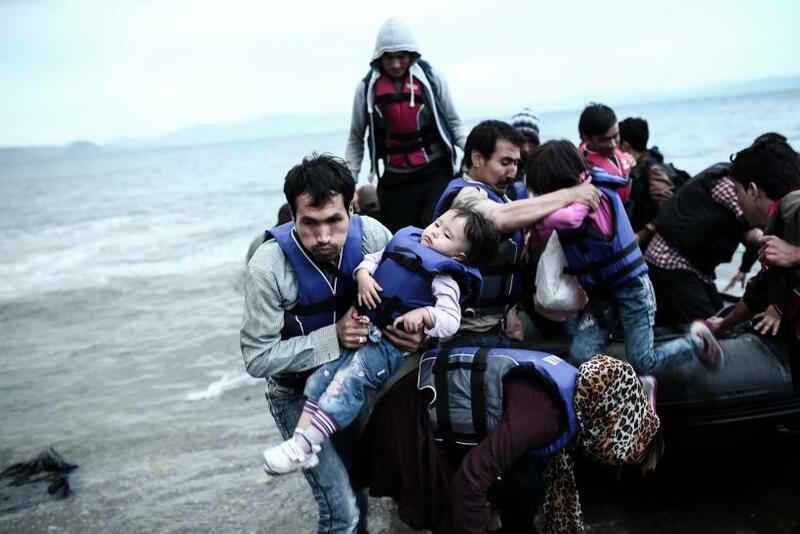 Greece has overtaken Italy as the European country with the most new migrants arriving per day. As Greek Prime Minister Alexis Tsipras last week signed off on the latest bailout package from European creditors, he and his reluctant government also accepted the conditions that came with the rescue -- another round of deep cuts to the national budget. Those cuts make limited funds to care for refugees almost non-existent. Europeans watching Greece’s economic catastrophe might struggle to imagine why anyone would risk his or her life to get to Greece. Yet the economic crisis gripping Greece is precisely what makes it so appealing to refugees: in the face of national budget cuts, every government agency including border control has been diminished, making landfall for refugees less risky than before. The greater the numbers of people arriving, the greater the economic burden on cash-strapped small towns that house refugees. "We Wake Up And There Is A Whole New Village"
Sobi Kalabalik sailed for Greece on a crowded smuggler’s boat in mid-July. Though a ferry from Turkey to Lesvos costs 10-20 euros and is only six miles away, smugglers often charge $1500 dollars to take refugees under the cover of night. Fleeing the violent conflict in Syria, Kalabalik, 24, and his brother Sobi, 26, made their way to Turkey on foot to catch a rubber dinghy to Lesvos. The Kalabaliks are just two of thousands refugees arriving daily on eastern Greek islands such as Kos, Chios, and Lesvos, as conflicts in Syria and Afghanistan continue to rage. Lesvos enjoys a reputation as an Aegean getaway complete with scenic beaches, picturesque ports, and a rich history (the poet Sappho was born there). 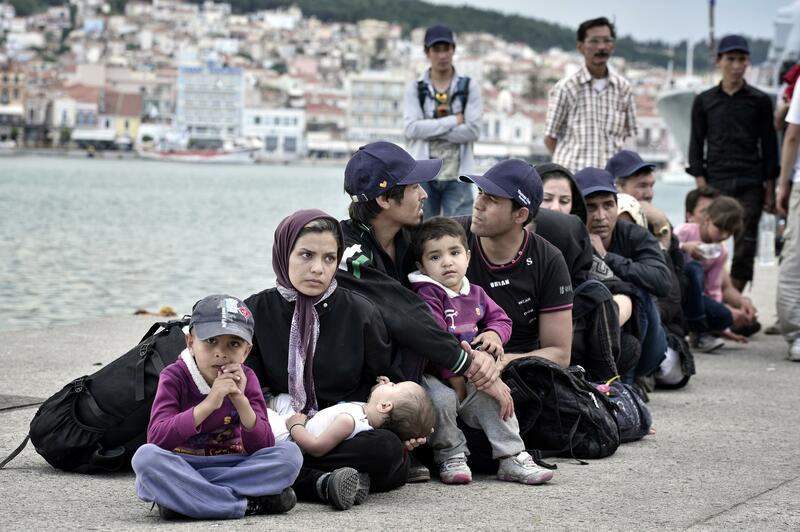 “We wake up and there is a whole new village,” said Marios Andriotis, press officer for the Mayor in Mytilene, Lesvos. 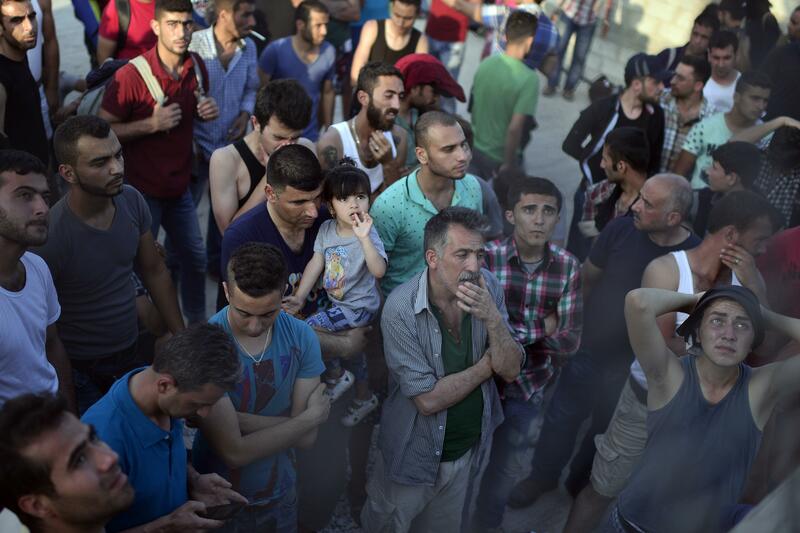 The city of Mytilene has only 9,000 permanent residents, and they receive hundreds of migrants a day. In June, Lesvos received 14,500 migrants, according to Aikaterini Kitidi of the United Nations High Commission for Refugees. Angelica Fanaki of the Hellenic Red Cross said that part of the problem was the fluctuations in numbers. An island could receive 500 migrants one day and 2,000 the next, making it hard to estimate how many supplies were needed or how many people should be on staff. At the time of this report, Fanaki said the Red Cross had 800 people working in Greece across the islands in refugee issues. Due to suffocating conditions, riots have broken out in some of the refugee camps between Syrians and Afghans. In the past six months, riots started between the two groups because of political and historic tensions. Some Syrians considered the Afghans as part of a Taliban population. The Afghans often don’t speak Arabic and were offended by a perceived superiority complex in the Syrians. “So we’re having the same war right here right now,” said Andriotis, comparing it to the situation that caused these refugees to flee their home countries. According to the Dublin Regulation, established in July 2013, the country where a migrant lands is responsible for that person’s welfare. The “country of first arrival” is required to identify, photograph, and fingerprint arrivals, then put their information in a common database. If the person claims asylum, then that country must grant refugee status when necessary. “In the beginning, everyone was supportive. 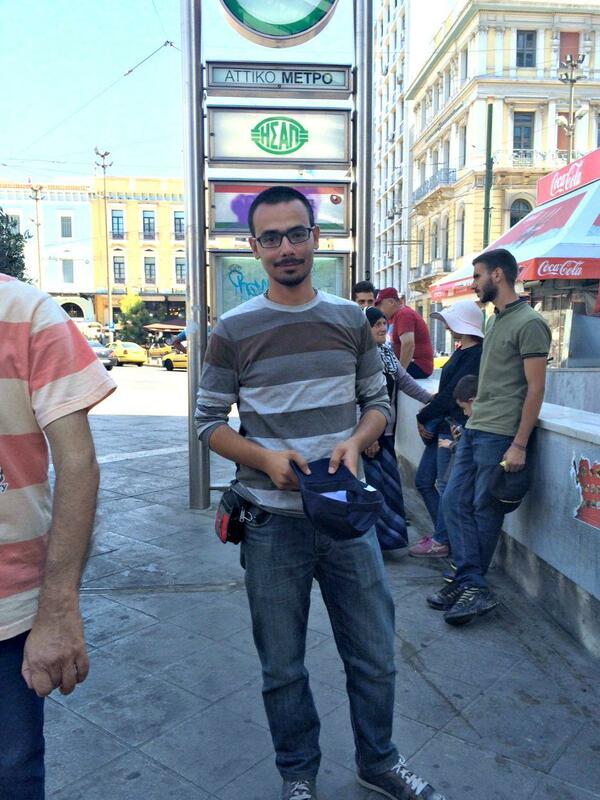 They said these are also humans that are oppressed by war, we should help them,” said Andriotis in a phone interview. Most of the help in feeding and caring for the migrants continues to come from local volunteers. “Because of the ignorance of the EU, they are turning against them,” he said. The money for the arrival process is supposed to come from a designated European Commission fund with supplements from Greece’s national budget, but given the huge numbers arriving every day, the majority of money for their care comes out of the islands’ municipal budgets. Some officials feared the presence of hundreds of migrants in their streets might discourage tourists from visiting the islands. Local authorities from Chios and Kos said that many vacationers had already canceled their stays, adding that tourists’ fears were unfounded because most of the migrants were quiet and peaceful. If that were to happen, “we risk giving more fuel to nationalist, xenophobic, and very racist discourse; and that in turn can have a snowball effect,” he said. Like the Jews in debt-weary 1930s Germany, a visible immigrant population often becomes the boogeyman for a society’s larger systemic problems. At the time this report was published, limited demographic information was available for the ethnic breakdown of the islands and for Greece as a whole. Census-takers in Greece were not allowed to ask the ethnicity of respondents, so the data remained limited. Data from 2009 showed that 93% of residents in Greece were Greek. However, that number included all people who held Greek passports, so it did not take into account ethnic origins. Aid workers and local officials spoke of the continuing generosity of local residents toward the migrant population. Though the townspeople are living off less and less, they managed to find creative solutions to help the migrants. The sacrifice of residents on these islands is not small, given the financial strain many of them are under. Due to austerity measures, Greek citizens can only withdraw 60 euros a day (30 euros a day from the banks on the smaller islands, according to local officials), and they will soon be facing higher taxes, reduced pensions, and fewer social programs. Manolis Vournos, the mayor of Chios, said that local businesses on the island helped build tents and donated mattresses. The citizens of Chios gave special food for the young children, milk for the mothers, and many other food items to supplement the limited survival food that migrants receive. Some women would walk down to the migrant camps and donate something every day, no matter how small. The generosity of small towns is not a long-term solution, however. The mayors in Chios and Mytilene said that none of the refugees wanted to stay on the islands, or even in Greece for that matter. The worsening debt crisis puts pressure on migrants to leave Greece as soon as possible, and most of them entered through Greece as a way to get to Northern European countries like Germany or France. The problem, they said, was the imbalance of the system. Under the Dublin Regulation, secondary countries are not required to take any asylum-seekers. Germany and France recently volunteered to take 40,000 refugees from Greece and Italy, though that number was only a drop in the pond compared to the huge number of migrants that arrive every day. The UN has advocated for an EU policy where all member states would be required to take a certain percentage of the refugees from Greece and Italy. For that to happen a majority of all 28 EU nations would need to vote “Yes” to verify the policy. Stella Kasdagli contributed reporting from Athens, Greece.